This oceanfront condominium resort is adjacent to Lydgate beach park and playground, with a walking path along the coast of uncrowded white-sand beaches. All one-, two- and three-bedroom suites feature full kitchens, free high-speed Internet access and large balconies with ocean views. Amenities include a pool, tennis court, BBQs and golf nearby. Oceanfront in Wailua, on Kauai's Royal Coconut Coast, adjoining Lydgate Beach Park with swimming beach. 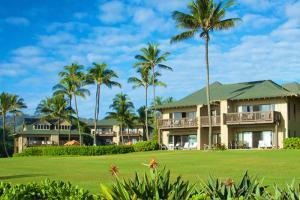 Located just 5 miles from Lihue Airport. No restaurant on property. Barbecue facilities. Wailua Golf Course, Lydgate Park, Boat & Helicopter Tours of Na Pali Coast, Wailua Falls.